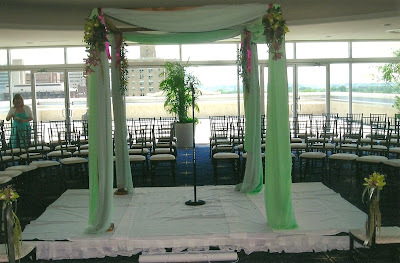 Sisters Flowers has their own canopy/Chuppah to rent for your wedding! 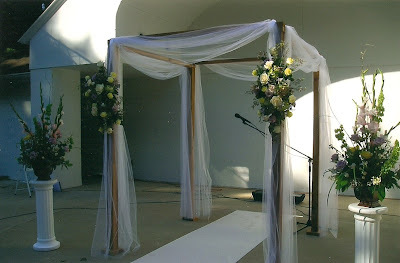 It is a beautiful 7 foot cedar structure that can be used with the wood exposed for an “earthy” casual ceremony, or with our white or ivory chiffon to cover the frame for a more formal look. 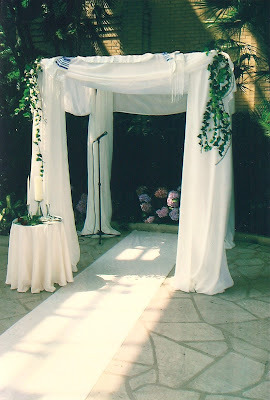 The canopy/Chuppah can be decorated and used in many different ways. Take a look at how some of our clients have incorporated it into their weddings…. This ceremony at the Piper Palm House featured the bride and groom under the chiffon-covered canopy with a garland of greenery and red roses across the top. 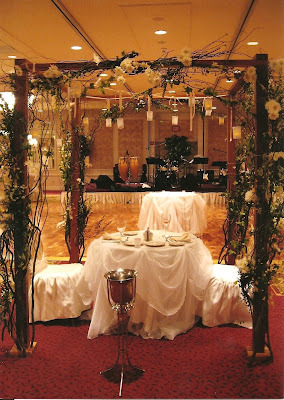 The canopy was used at this ceremony to dress up the ballroom and bring focus to the “altar”. The chiffon was left to looser to billow and give a romantic feel. 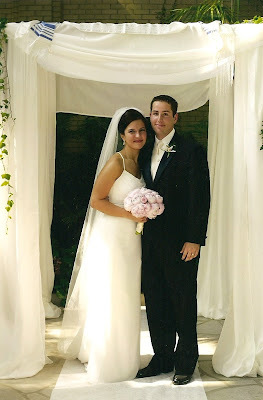 Two large side arrangements of flowers tied in the wedding colors. This is an example of the canopy with tulle covering to allow the wood to show through. The arrangements on the canopy and the two on the side columns complimented each other. Custom fabric can also be purchased to accent the structure with a certain color. 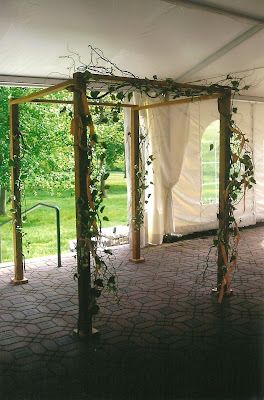 For a casual or semi-outdoor wedding, consider leaving the wood exposed and decorating it with willow branches and ivy as this couple did for their wedding at the St. Louis Artists’ Guild. This Chuppah had a little bit of everything. The draping flowers across the top and on the legs showed splashes of color against the custom orange fabric. 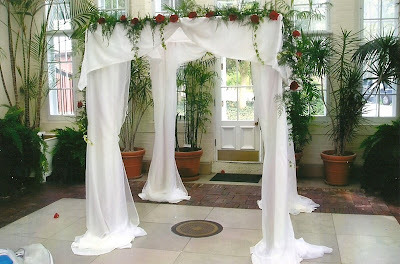 This look was romantic with the fabric-draped Chuppah and ivy trailing down the sides. The structure has a footprint of about 6ft. x 7ft., so it’s the perfect size for all ceremonies. 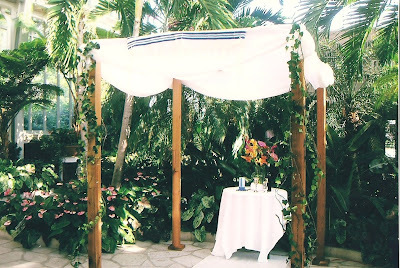 Another option is to cover only the top of the Chuppah, leaving the legs exposed or accented by hanging greenery. 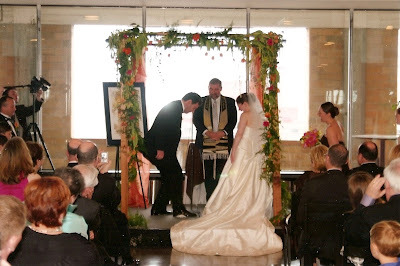 This Chuppah design was another variation of using the topper white using flower garlands to brighten up the exposed legs. 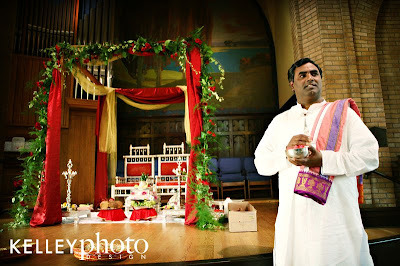 Our canopy has also been used and decorated for Indian ceremonies. This canopy was utilized in a unique way. Instead of using it for the ceremony, this couple used it as a romantic flower garden surrounding their sweetheart table. The structure was decorated with all white flowers and curly willow to bring a “garden get-away” to the bride and groom inside the ballroom reception. Any combination of these looks is possible and can be customized for your event. 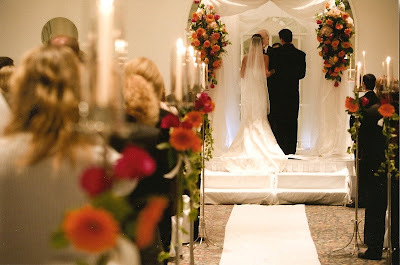 When calling or meeting with us, please mention that you would like to use our canopy or Chuppah as availability is limited.